The Create in CRM step for Automated Programs allows the ability to create highly qualified leads in Salesforce.com based on lead score qualification and/or create Account, Opportunity and Opportunity Contact roles, create tasks and activities for the Sales Team to follow up, and create Opportunities from forms or lists where the lead/contact has explicitly expressed interest in doing business with your Organization. Add new Act-On records into Salesforce.com as new leads and assign them to an Owner or a Lead Queue. 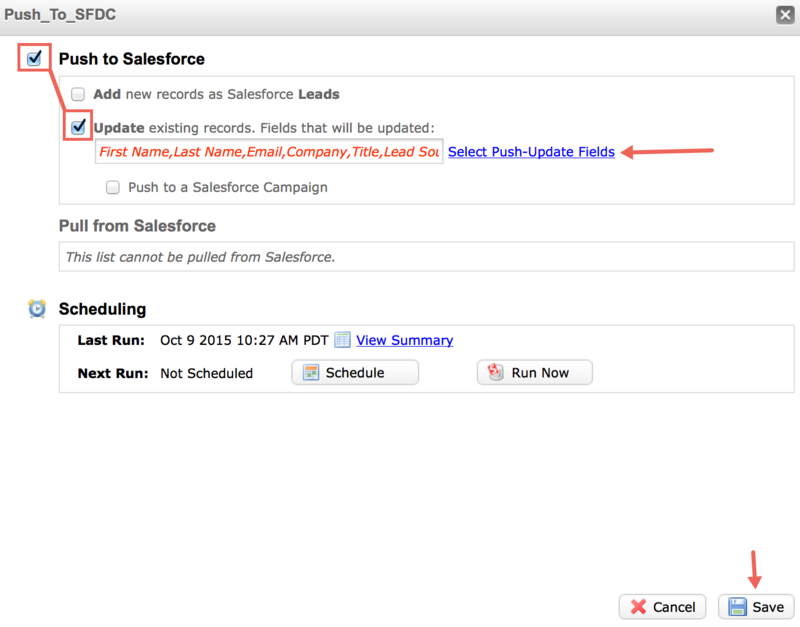 Push members to a Salesforce Campaign with the desired Campaign member status. Create highly qualified leads in Salesforce.com based on lead score qualification and/or create Account, Opportunity and Opportunity Contact roles. Create tasks and activities for the Sales Team to follow up. Create Opportunities from forms or lists where the lead/contact has explicitly expressed interest in doing business with your Organization. Add notes to records with Salesforce.com to document interactions that have occurred. Create calendar events in Salesforce for a scheduled meeting or conference call. When selecting Create new records, you have the option to create any new record based on email address as a new Lead or Contact. You also have the option to "Create a new record every time, allowing duplicates" to be created. The data pushed from this step will include any list fields which have matching fields in Salesforce. For instance, if First Name is in your list it will push that value to the First Name field in Salesforce. It is important to make sure that the source list field names are mapped to your standard CRM field names. Click here for more information on Standard Field names. In addition, you have the ability to add fields that may not be present on your list. When clicking on the “Add field to set on new records”, you can select a field from your Salesforce field names to include in this step. For instance, you may want to add information containing the lead source, even though the lead source field is not in your list. Click on “Add field to set on new records”, and choose Lead Source to select the appropriate lead source value. Salesforce. Upon creation of a new lead/contact, you can assign an Owner however you are not able to re-assign an existing record to a different owner. If you are using Salesforce queues, you can set the owner to a lead queue. The ‘Add field’ option under ‘Push new records as…’ does not apply to the ‘update existing records’ selector. This option is best used if there is a Change Field step prior to the Create in CRM step so that existing records are updated once the field value is changed. Refrain from using Push to Salesforce option in the prior Edit Field step when used in conjunction with the Create-in-CRM step. When selecting Update existing records, you have the option to update Salesforce with the data in your list. The data pushed from this step will include any data from list fields which have matching fields in Salesforce. For instance, if First Name is in your list it will push that value to the First Name field in Salesforce. It is important to make sure that the fields in your list match your Standard Field Names. Click here for more information on Standard Field names. You also have the option to "Update when multiple matches are found in CRM.” If your Salesforce environment contains duplicates, checking this box will update the information for each duplicate record. If the option is not checked and duplicates are present the records will not be updated, but any additional entities (see below) will still be created. There is no need to schedule or run now. Simply select the fields and save. The automated program step will then look at these settings upon the push when that step is initiated. dropdown along with the corresponding campaign member status by clicking on ‘Add Field’. Create an event calendar in Salesforce for a scheduled meeting or conference call. Creating an event allows you to select an owner, set a start date/time, subject, duration, etc. You can also ‘Add Fields’ to repeat, set reminders, provide meeting location, etc. When assigning a task, you can give the task a status, priority and assign it to an owner. You can also ‘Add fields’ to include a start/end date, a description or a recurrence. The task could be assigned to a specific Owner or to the Owner that owns the lead/contact record in Salesforce. Note: When using queues, you cannot use the ‘Use Owner from Leads/Contacts’ because you cannot assign a task in Salesforce to a queue. Opportunity Contact Role below for more information. Note: When using queues, you cannot use the ‘Use Owner from Leads/Contacts’ because you cannot assign an Opportunity in Salesforce to a queue.